Muffins are always a delightful treat in the morning, but lately I’ve been turning them into a treasured mid-afternoon snack–especially when I’m on campus between classes. I think I ate so many dried fruit/nut bars as a post-bacc student (Pure Bars, I’m lookin’ at you) that I got a little weary of them. I still like to make them at home (my lemon kissed cashew hemp bars are a favorite), but I’ve also been branching out into other snacks that can satisfy a sweet craving and be easily transported. These vegan, gluten free pumpkin muffins fit the bill, and they happen to be a perfectly seasonal treat for fall. We’ve all had pumpkin bread and pumpkin muffins before, and for the most part, these are a fairly traditional spin on that recipe. What I love about them, though, is the addition of blackstrap molasses, which turns them into a pumpkin and gingerbread hybrid of sorts. It adds a beautiful, deep color, both before and after baking, and it also adds an unmistakable flavor and rich sweetness to the muffins. Coupled with the cinnamon and cloves, it screams all things autumn. The texture of these muffins isn’t bad either: check out that perfectly moist crumb! For this recipe, I used Bob’s Red Mill All-Purpose Gluten Free Baking Flour, which is my go-to. Other varieties should work, though there can always be some differences in texture based on the brand you pick, so I’d recommend using Bob’s or a brand that you’ve had consistent and successful results with. Whole wheat pastry flour will also work perfectly, and spelt flour will add a very nice, earthy flavor. Here’s the recipe. Preheat your oven to 350F. Line a 12-muffin baking sheet with liners, or lightly oil and flour the muffin cups. Mix the flour, sugar, salt, cinnamon, cloves, baking powder, baking soda, raisins, and walnuts together in a large mixing bowl. In a medium bowl, whisk together the vinegar and almond or soy milk till frothy. Whisk in the pumpkin, molasses, and oil. Fold the wet ingredients into the dry ingredients and combine well. Pour the batter into liners by the heaping ⅓ cup and bake for 18 minutes, or until a toothpick inserted into the center of a muffin emerges clean. Allow the muffins to cool, and dig in! Once cool, muffins should be stored in an airtight container in the fridge for up to five days. They can be frozen for up to 3 weeks. If you’d like to make this recipe your own, try folding in different nuts or seeds or dried fruit (in place of raisins, for example, chopped dates or dried cranberries; in place of walnuts, pumpkin seeds). 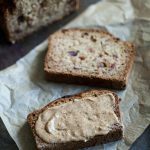 I love to top these with a little apple or pumpkin butter, jam, almond or cashew butter, or–for a traditional treat–some Earth Balance or homemade vegan buttery spread (there’s a great recipe in Lisa and Nicole’s new book, DIY Vegan!). A basket of these muffins would be a lovely contribution to any Thanksgiving spread! You could also use them for holiday gifting, or whisk together the dry ingredients and include a card with wet ingredient and cooking instructions as a DIY present. Whether you do that or simply choose to keep them around as a tasty snack, I hope you enjoy them. Before I go, a quick head’s up that the Spright vegan class sold out in a flash this past Sunday! I’m thrilled that there was so much interest, and so far, the class experience is a total blast. I’ll be leading again in December, and once again, the class will be 100% free, so I’ll keep you guys posted on signup dates. Hope to see many of you in future classes! These look AMAZING! I’ soooooo NOT a baker but really need to TRY more this winter! These would be on my list to try! 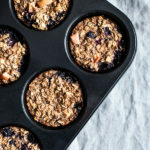 These look like the perfect breakfast muffin! Pinning! I love blackstrap molasses, especially at this time of year! I could just eat a spoon of it, even though I probably shouldn’t. The muffins look great! gingerbread definitely trumps pumpkin spice for me! (although i do love pumpkin!) i just love the spicy warmth of ginger. i made a few test batches of gingerbread cookies last year and fell in love with molasses, then made an amazing molasses/ginger bread!! I’m working on the pumpkin version now. what does whisking the AVC/milk do here? The acid in the vinegar helps to activate the baking soda, in order to achieve “rise” in the muffins! Mmm….love both gingerbread and pumpkin bread, so I bet these are insane. I’ve been craving muffins lately. I am sure that this recipe will be wonderful but there is no ginger in the ingredients. Oh wow! These muffins look amazing! Can’t wait to dig into these! I noticed all your recipes seem to be gluten-free now. did you cut a gluten out of your diet? Just curious. Great question! 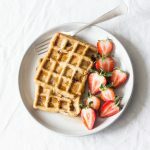 I’ve tried to create GF baking content for quite some time now, only because I was usually asked for a GF option, and I wanted to offer recipes that were equal opportunity. Last fall, however, my allergist and GI doctor simultaneously recommended a gluten elimination, which did help me to feel less symptomatic (from both my allergies and from my IBS symptoms, which cycle in and out). Because I don’t have a gluten allergy (I’ve been tested for celiac several times) or a very serious intolerance (i.e. I certainly don’t feel immediately ill when I do eat gluten), I haven’t really self-identified as gluten free. So, while I’ve been creating GF recipes almost entirely, and don’t eat many foods that have gluten, it would be an overstatement to say that I’ve eliminated it entirely from my diet–hence my not announcing anything to that effect 🙂 I’ll still be offering WW pastry flour as an option in most baking, as I find that it works well interchangeably with GF all-purpose for the most part. Interesting! Thanks! I’ve been having some skin issues and fatigue and I’m trying to avoid cutting out gluten, because I love it so, and dislike have food restrictions but debating a trial elimination myself. I had the same tensions, given my history and the fact that I’ve worked so hard to expand and open up my vegan diet! I actually found it amazingly easy, in part because I love so many non-glutenous grains already, and cook them often. Plus, GF pastas and breads are better and easier to find. And the GF baking challenge was already something I was working on 🙂 I’m lucky in that I don’t have to be as careful about this as others with very apparent intolerances do, and I’m sensitive when speaking about it because I know that my approach, which is a little flexible, would not work in the case of a more serious intolerance. That said, my boyfriend and I were pretty surprised at which a difference my own experiment made; I didn’t really expect results from it. I hope you get to the bottom of your fatigue, Sylvia! Nice looking pumpkin spice muffins! Awww. That’s great to hear 🙂 Hope all is well! Just made these, so delicious! Thank you. I just made these, subbing regular molasses for blackstrap, and they were so good! Definitely hit the comfort spot. (Which I needed!) They are delicious with a bit of earth balance and a cup of tea. Thanks for another great recipe! I love anything and everything pumpkin so I would love to try these out! I hope they taste as good as they look! Made these today- so good. Thanks for the recipe! I came here to find a pumpkin muffin recipe, and these are hands down the best muffins I’ve ever made. Thank you so much for the perfect recipe, Gena! I followed it to a T using the wwpf, almond milk, and brown sugar options, except I misread the quantity of pumpkin and accidentally used the whole can! They are so good my 2yo son and I can’t stop eating them! Can I use regular molasses? Also, Is there a reason there is no vanilla extract? No reason — you can certainly add a teaspoon if you like! And yes, regular molasses will work well.